How to buy a house with no money down? Check out the USDA Rural Development home loan program! The United States Department of Agriculture offers a zero down home loan program. USDA no money down loans help people purchase homes in small towns and/or rural areas. In order to qualify for the loan, you must purchase a home in an area designated as rural by the USDA. One of the requirements of the USDA program is that your annual household income cannot exceed the limits set by the program. These income limits vary by county and family size. In most areas of Ohio, Indiana, Kentucky, and Florida, the limits are $82,700 for a family of 1-4 and $109,500 for a family of 5-8. Some counties do have higher limits. You may be able to deduct certain expenses from your income. If you are close to the income limit we suggest working with your lender to identify your eligibility. Borrowers cannot use the USDA zero down home loan program to purchase farmland or any type of income producing property. Most importantly, these loans are not restricted to “country homes”! Instead, they are designed to encourage homeownership in rural areas. Many borrowers are surprised to learn that they can purchase homes in towns that are considered rural! Does not require a down payment. This a true 100% financing loan. You may be able to finance closings costs into the loan. The property MUST be located in a rural area as defined by the USDA. Click here to learn more. The borrower must meet income eligibility guidelines. Eligibility is based on all household income, including income from adults living in the home who are not applying for the loan. Click here to learn more. How to buy a house with no money down? Check out a VA mortgage! VA Loans provide home financing to our honored veterans. The United States Veterans Administration guarantees VA loans, and qualified lenders issue the loans. The VA determines eligibility for VA loans. Click here to learn more about the VA’s eligibility requirements. If you are interested in pursuing a VA loan, your lender can assist you in obtaining your certificate of eligibility (COE). Does not require a down payment. This is a true 100% financing loan. Does not require private mortgage insurance. A VA funding fee of 0 to 3.3% of the loan amount is paid to the VA. The funding fee may be financed into the loan. Fixed and adjustable rate mortgages. If you’re not looking for a home in a rural area and you’re not a veteran, don’t worry! While they aren’t zero down home loans, there are still other programs that offer low down payment home loans. FHA loans are an attractive option for many borrowers and offer down payments as low as 3.5%. FHA loans offer flexible qualifying requirements. They are a great solution for many homebuyers, not just first time homeowners. Conventional loans have many programs and offer down payments as low as 1%, 3%, and 5% depending on the program. 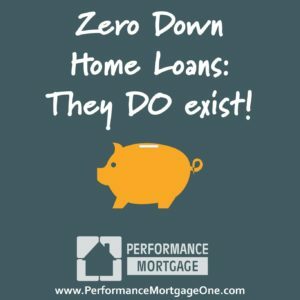 What zero down home loan programs do you qualify for? If you are trying to figure out how to buy a house with no money down, our team is ready and waiting to assist you! Give us a call today at 937-548-8222 or apply online.